How Long Does Salmon Keep in the Freezer? Technically, salmon, as most foods, can be stored in the freezer indefinitely. 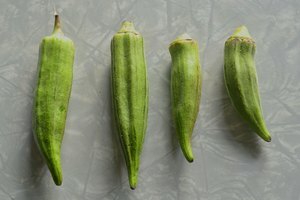 But its flavor, texture, appearance and overall quality suffer as time passes. To ensure that salmon is still of good quality after its stint in your freezer, use frozen raw salmon within three months, and frozen cooked salmon within six months. If this seems like a short window, it's because of salmon's high fat content. Fatty fish like salmon, tuna, mackerel, herring and anchovies don't maintain quality as well as lean fish like cod, bass, flounder, snapper and tilapia. Raw lean fish hold up in the freezer for up to six months. Will salmon keep overnight in the refrigerator? Sure! Raw salmon is fine in the fridge for up to two days. This applies to fresh salmon, salmon purchased as "previously frozen" and salmon you froze and thawed yourself. 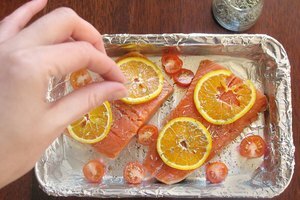 Freeze salmon in individual servings for convenience, so you can just take out however many fillets you want to prepare. If you caught the salmon yourself, it's best to clean and fillet it before freezing. And remember: Always wash your hands after handling raw fish and disinfect any surfaces and kitchen tools it comes into contact with. The key to freezing salmon so that it holds its quality for up to three months is to protect it from exposure to cold air. Such exposure allows ice crystals, or freezer burn, to develop on the food. If you have a vacuum sealer, that's an excellent option for freezing fish. Otherwise, place the fillets at the bottom of a freezer bag and fold down the top of the bag a few times, pressing out the air as thoroughly as you can and securely sealing the bag. Alternatively, tightly wrap fillets in multiple layers of plastic wrap, diligently preventing air pockets. Write the freeze date on the package. If you're up for a more drawn-out, interactive process, ice glazing the salmon is highly effective for preserving its quality in the freezer. First, clear space on a freezer shelf for a baking tray. Put the salmon fillets on the tray, unwrapped and uncovered, and stick it in the freezer. Let the salmon freeze, checking that its flesh is no longer pliable. Then take the fillets out of the freezer, submerge them in cold water and return them to the baking tray in the freezer. Wait for the layer of water to freeze, then dunk them again and put them back in the freezer. Repeat this process a few times until the fillets have a full, substantial coating of ice around them. 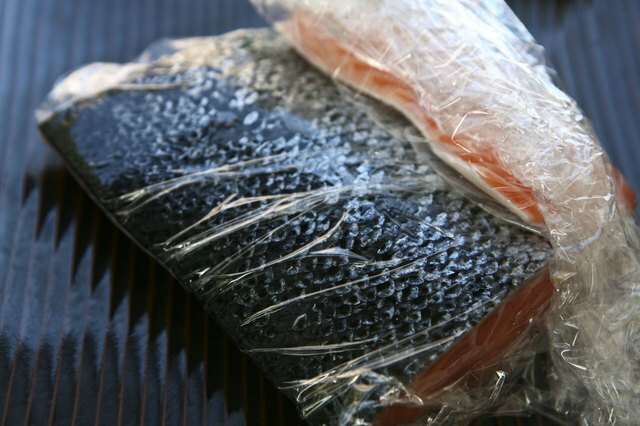 Seal the ice-glazed salmon in freezer bags, pressing out the air, or wrap them tightly in several layers of plastic wrap. Date the package. There are three safe ways to defrost frozen salmon. Note that none of them include letting it sit out at room temperature, which leads to bacteria growth. 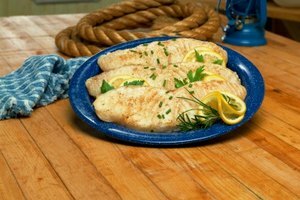 Fish should never be set out at room temperature for more than two hours. The best but slowest way to thaw frozen salmon is by moving it into the refrigerator for about 24 hours. This method preserves the quality well and also allows for some flexibility you don't get with the other methods. Cook or refreeze it within two days of thawing, but expect some diminished quality if you refreeze it. A much quicker way involves fully submerging the frozen salmon in cold water in a leak-proof package. Depending on the size of a fillet, this takes anywhere from about half an hour to a couple of hours. Replace the water with new cold water every 30 minutes. Cook the fish right away after thawing by this method and don't refreeze unless it's cooked. The fastest, but least desirable, option is to use your microwave's defrost function. This takes only minutes, but it starts to cook the salmon. That means you must finish cooking it immediately, and you'll probably end up with some overcooked fish, particularly at the outer and thinner parts of the fillet. Salmon thawed in the microwave must be cooked before refreezing. For the record, you can cook frozen salmon; it just increases the cooking time by about 50 percent. This doesn't work well on the stovetop, but it's fine in the oven, on the grill or in the microwave. 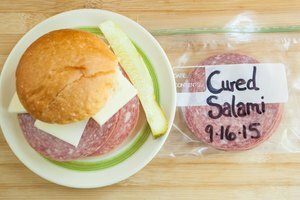 Real Simple: How Long Can You Refrigerate or Freeze Food? Eric Mohrman is a food and drink, lifestyle, and travel writer. He spent 10 years working front- and back-of-house in a few casual and upscale restaurants, adding professional experience to his love of eating and cooking. He lives with his family in Orlando, Florida. His stories on food and beverage topics have appeared in numerous print and web publications, including Visit Florida, Orlando Style Magazine, CrushBrew Magazine, Agent Magazine, Dollar Stretcher Magazine, The 863 Magazine and others. How Long Can You Keep Frozen Fish? How Do I Cook Frozen Salmon Filets?